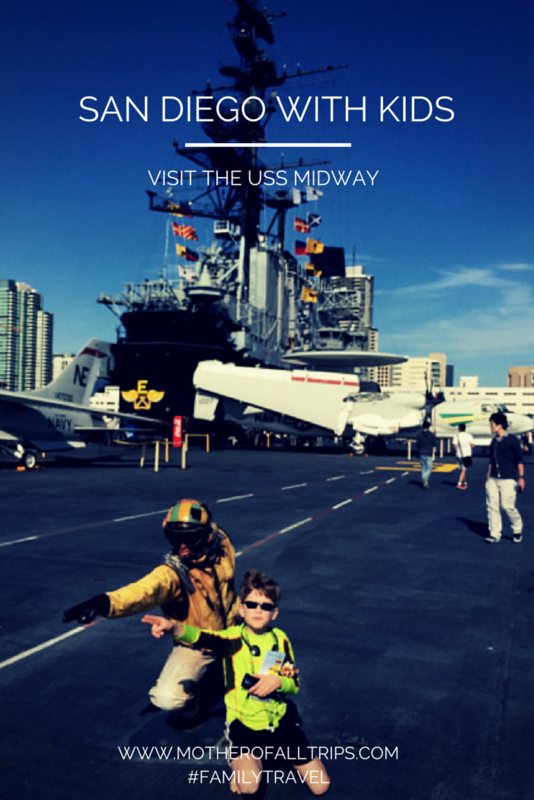 Even if you think you aren’t interested in military history or aircraft carriers, trust me – you and your family will enjoy a visit to the USS Midway. 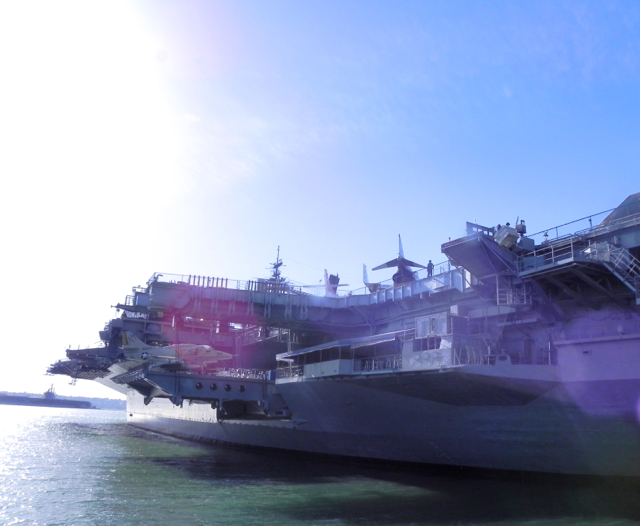 The Midway, which my family was able to visit at a significant discount thanks to the team at the San Diego Tourism Authority, was the longest serving aircraft carrier of the 20th century and saw action in Vietnam and the Persian Gulf. It was decommissioned in 1992 and is docked near downtown San Diego. That’s all well and good, but here’s something more than just facts: Thanks to its sheer size, ingenuity, physics, to say nothing of the fact that when it was in service its kitchens used to make and serve 500 pies daily, the USS Midway is straight up cool. It may also be the ultimate museum for a multi-generational trip. In our family my in-laws and my kids were equally interested and engaged by the many stories this boat and the veterans who staff it as docents have to offer. 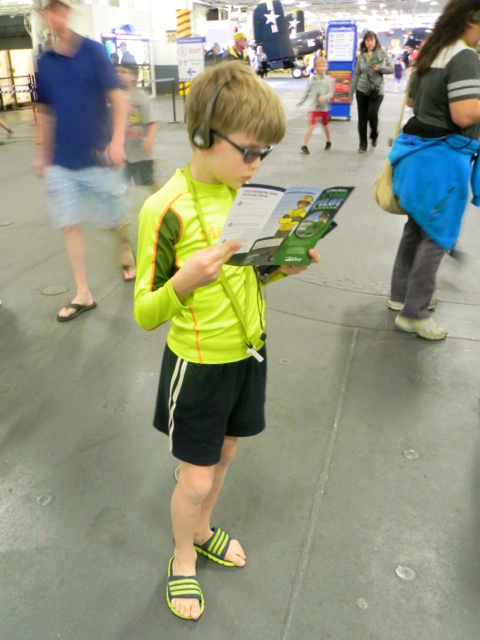 A numbered audio guide is included in the price of USS Midway admission, and you will definitely want one as it often offers far more information than the signage in the exhibits. 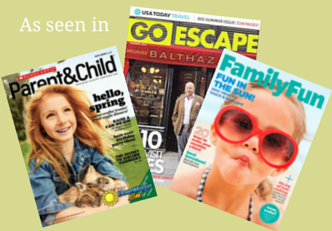 There are separate numbers with information for kids. 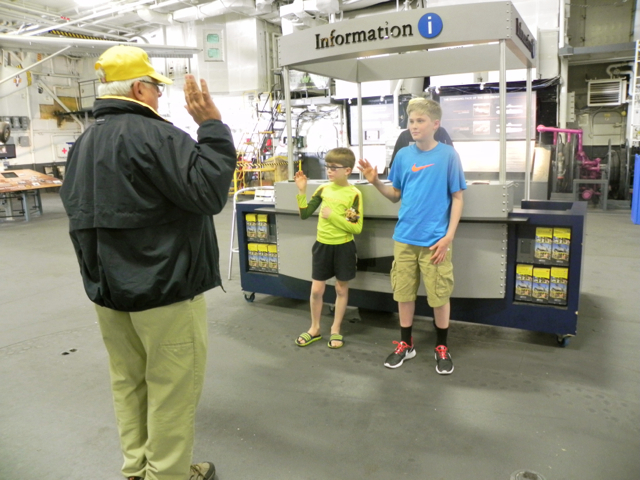 When you pick up your guides, ask at the information desk across the way for a Junior Pilot scavenger hunt so your kids can earn their “wings” by answering questions during your tour. It’s hard to believe an adult slept here. 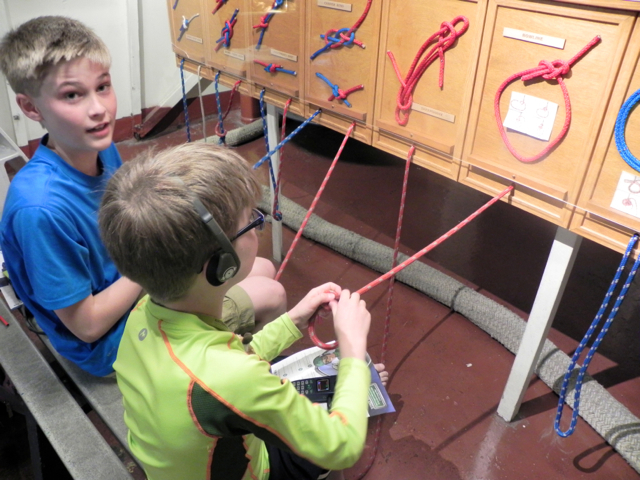 Tying knots, just like real sailors. 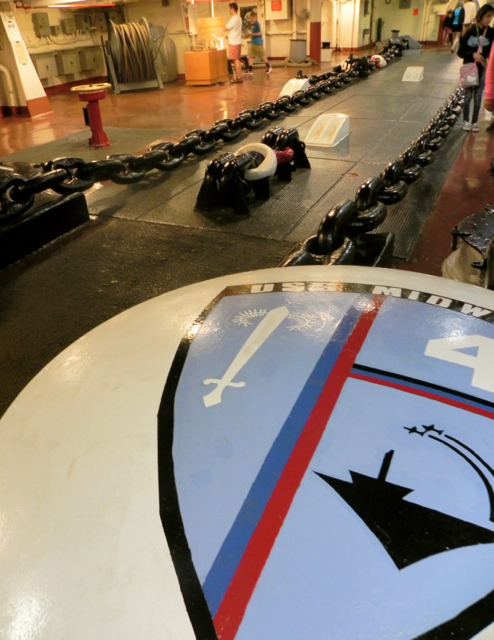 Big ship, big anchor chains! What do you suppose these two did? 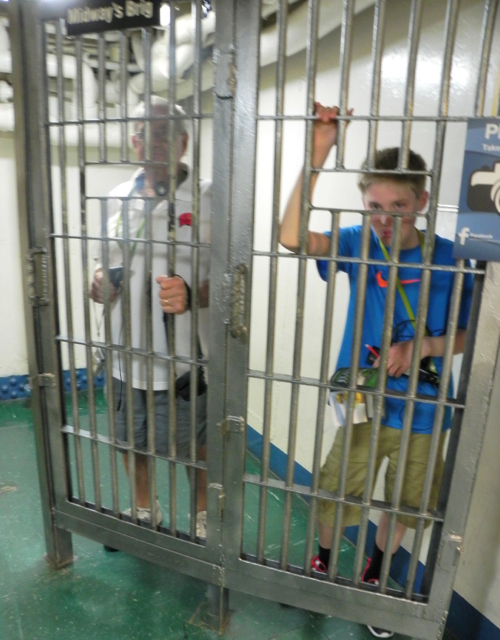 To marveling at the fact that the telephones have dials we got to see the human side of life on this enormous ship. Since this is really a floating city, or at the very least a small town, my children’s imaginations were completely captured by the notion that all of this routine activity took place out to sea. Because the Midway is an aircraft carrier, a good portion of the tour is spent talking about the elite squadrons of Navy pilots who served on it. 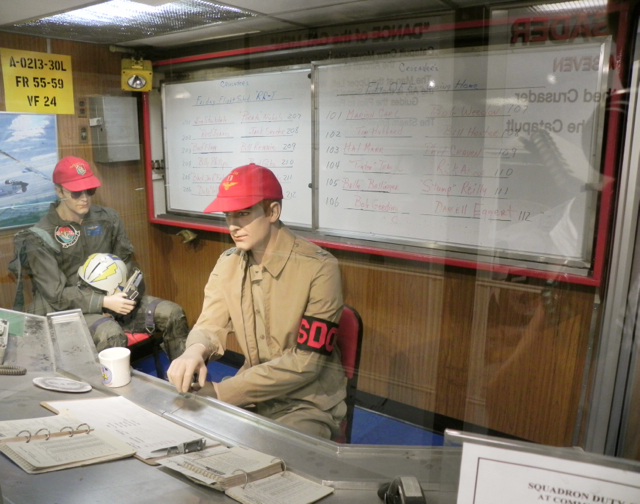 We explored the Ready Rooms where they hung out and also prepared for missions and we saw the command centers where officers told them what to do. Each squadron had its own ready room. These guys had a lot to keep organized. 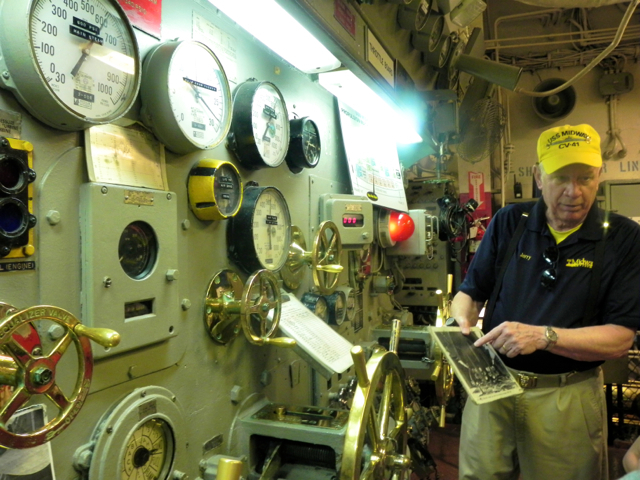 And lest you think we didn’t see how the mechanical side of the boat worked, we also visited the Engine Room where our docent Jerry showed us how the ship’s boilers make its four propellers turn via mind-bendingly large pistons. Later on it was really interesting to learn that the steam from these pistons actually help planes on the flight deck get enough speed to take off quickly. 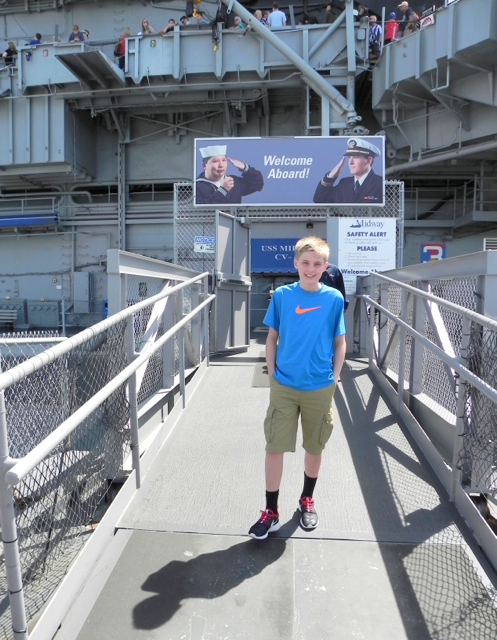 My 13-year-old son Tommy, who loves military history, asked Jerry if he served on the Midway. He laughed and winked and replied, “ I served on real ships – destroyers – this is just a floating airport.” But he seemed pleased to be asked and told us he was in service from 1958 until 1988. He was even more pleased when Tommy said, “Oh, so you served in Vietnam then” and proceeded to share some of his stories with us, which Tommy loved. 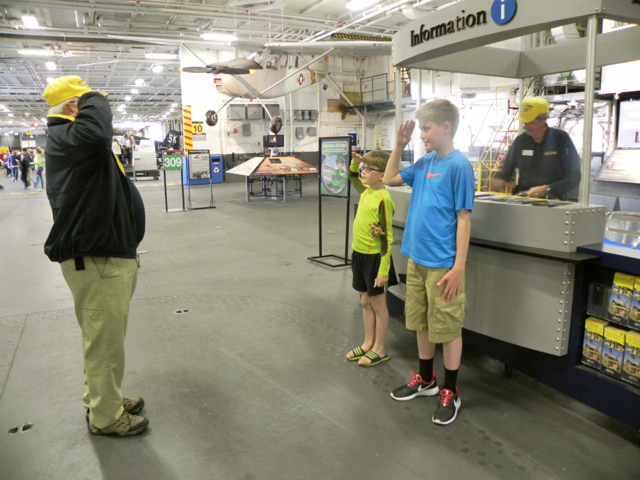 The flight deck is a highlight of the museum, and families with young children who are fascinated with planes might actually want to head straight up to the top of the ship when they arrive. Visitors can climb inside a number of the aircraft that are parked here, including the helicopter that picked up astronauts on five of the Apollo missions, including number 11, also known as the one that went to the moon. This helicopter picked up astronauts. 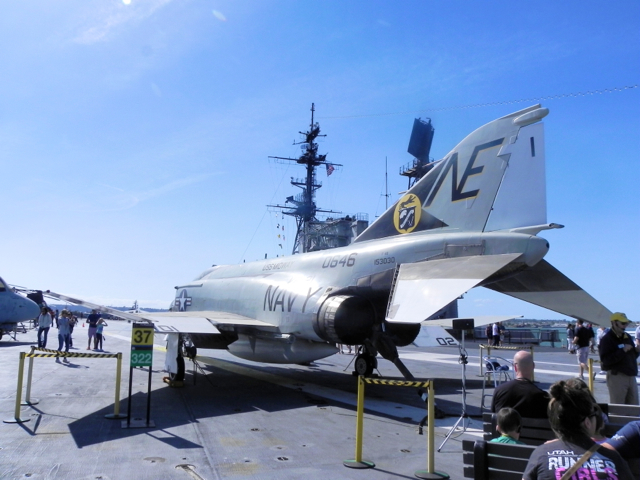 It was particularly interesting to learn about how the planes take off and land on this relatively small space – docents at either end of the deck explain how this works in detail. The landing area is about 80 feet, or the size of a tennis court, and planes arrive at 160 miles an hour and are stopped by an arresting gear engine and a series of three cables. 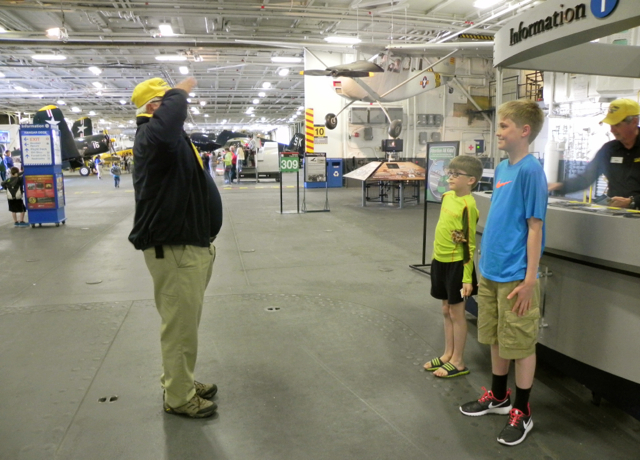 Docents offer detailed explanations of how planes take off and land. For takeoff, planes are catapulted off the ship by huge pistons underneath the flight deck that are powered by steam from the engine room. The sheer volume and speed of how this all happens is staggering – planes took off and landed about every 45 seconds. 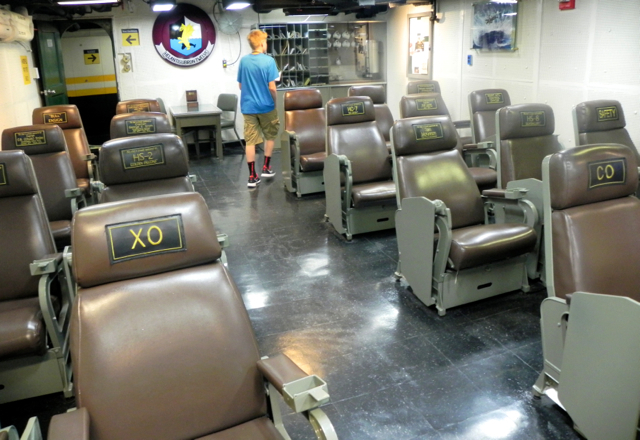 The flight deck is also where you can check out the captain’s quarters and the bridge (called the island). The bridge is only open by guided tour; if you want to see it before the museum closes you need to line up no later than 3:30. And swear an oath of allegiance, which they did with aplomb and maybe just a bit of giggling. The USS Midway is fascinating and even kind of beautiful in its own way – so many humans and moving parts working together in the middle of the ocean. 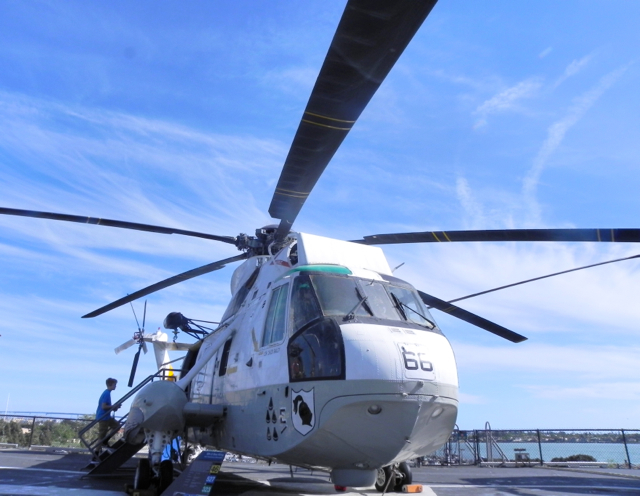 Many of the flights that left its decks were for rescue and humanitarian missions. It has the magnificence that human ingenuity brings to large-scale communal purpose and the wow factor of imagining high-speed flight. Want to learn more about our visit to San Diego? 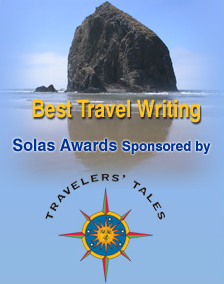 Check out my review of our stay tat the Loews Coronado Bay Resort on CiaoBambino! Visiting the Midway involves a fair bit of walking – the ship is the length of three football fields. It is also easy to get separated because everyone is wearing headphones. If you’ve got multiple kids and adults in your party it might not be a bad idea to assign chaperones. My one criticism of the audio guide is that sometimes the stations are so spread out that you lose track of where you’ve been and are headed next; individual stops also often describe kind of a large area so that it can get a little confusing – more than once what I was looking at and listening to didn’t match up. I might have prevented this if I’d spent a little time before we started studying the Midway Tour Map, which offers suggestions for abbreviated tours and also indicates where stops are located on the ship. And don’t stick just to the guide – I highly recommend chatting with any docents you come across. They are not only knowledgeable but passionate about their own experiences and full of rich information. 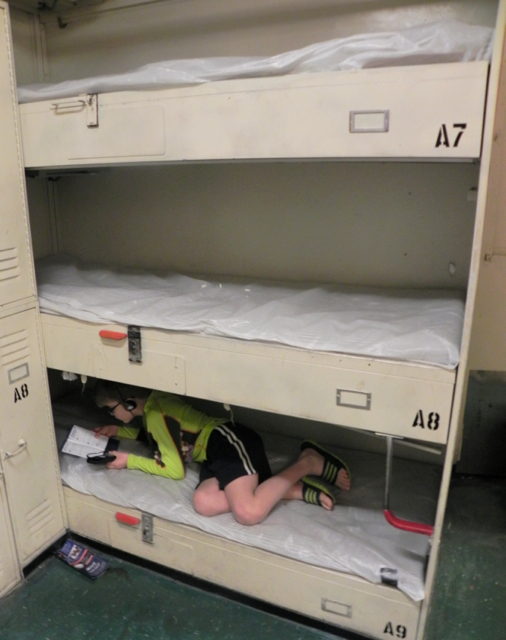 If you’ve got kids who are really interested in ships, planes, or military history, a fun option might be a family overnight stay on the Midway. 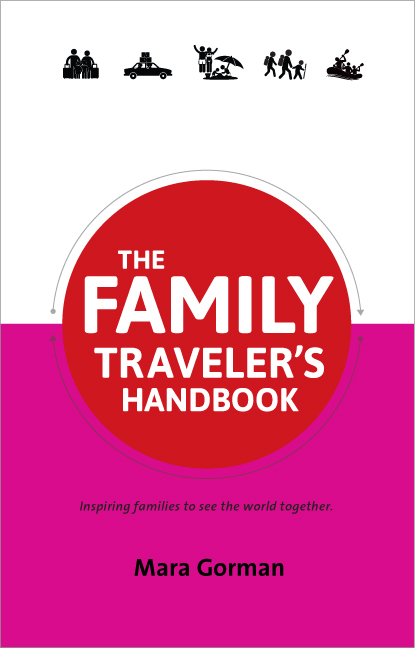 It’s $100 per person, but since you get dinner and breakfast, I’d call this a bargain for a vacationing family. After our visit we had dinner at The Fish Market right next door to the ship and also overlooking the water. There are actually several restaurants in this building – the more upscale is upstairs, with a larger more casual dining room downstairs. There’s also a separate sushi bar (although you can also order sushi off the dining room menu). It’s perfect for families who like seafood, with a large crowd-pleasing menu. It’s also noisy, so no worries about young children disturbing other customers. I recommend making reservations, as it can be very busy, even midweek. We did this a few years ago as part of a family reunion and took 30 people of varying ages to the Midway. It was one of the most fun and interesting things we did in San Diego. You nailed it that people of all ages will find things to love about the U.S.S. Midway. Thanks for stopping by Katie – I’m glad your family had a good time there too. 8 hours ago by motherofalltrips Terrible drive today but made up for it by eating all the (uh-mazing) pizza.